The bus stops near the west exit of Tokyo's Shibuya Station are still there – but they were no longer showing up on the map. Google Map users in Japan had started noticing other malfunctions last week: alleyways disappearing, roads and railways getting a 'weird' look on the map, buildings being misplaced. Complaints came in so thick and fast that Google was forced to apologize for the inconvenience. The tech giant's Japanese arm said it would launch an in-house investigation to resolve the problems. 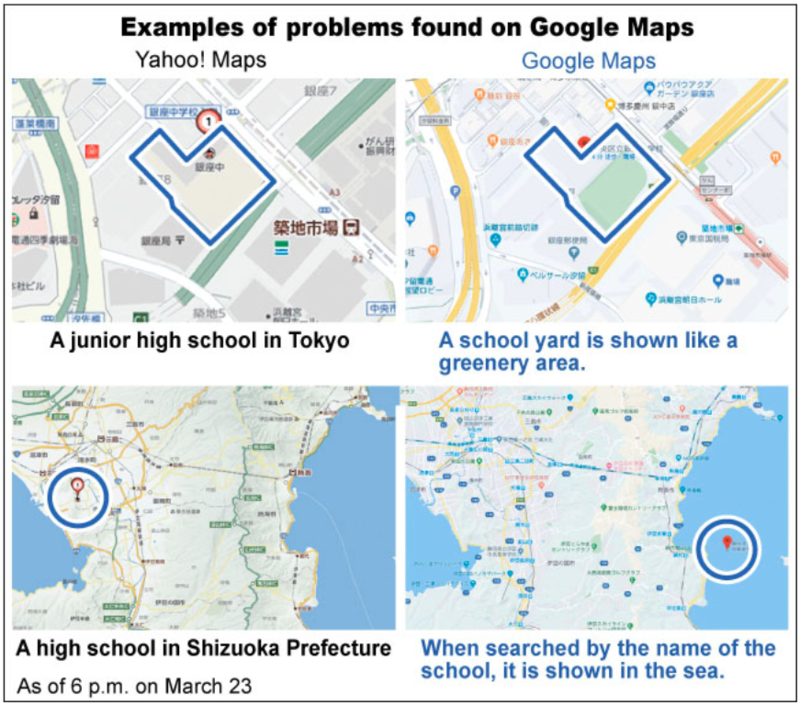 While it's still unclear exactly what happened, the map malfunctions likely relate to Google's announcement on March 6 that it would update the Japanese section of Google Maps within a few weeks. At that time, no mention was made of Zenrin Co., the Kitakyushu-based mapmaker and producer of car navigation systems that has provided data to Google Maps since 2005. At this point, it is unclear whether the faulty data was provided by Zenrin or is the result of the cancellation of the company's contract with Google. Speculation on the latter possibility – social media chatter indicated the 'Zenrin' copyright attribution had disappeared from the bottom of the Google Maps screen – led to a 16% drop in Zenrin share prices at the Tokyo stock exchange last Friday. Neither company has so far commented on the current status of Zenrin's relationship with Google. Here are 7 more dicey and hilarious times Google Maps malfunctioned. Map found here at the Asahi Shimbun.